WildLife Sydney Zoo is such a unique experience! Just like being in the outback but right in the middle of the city. 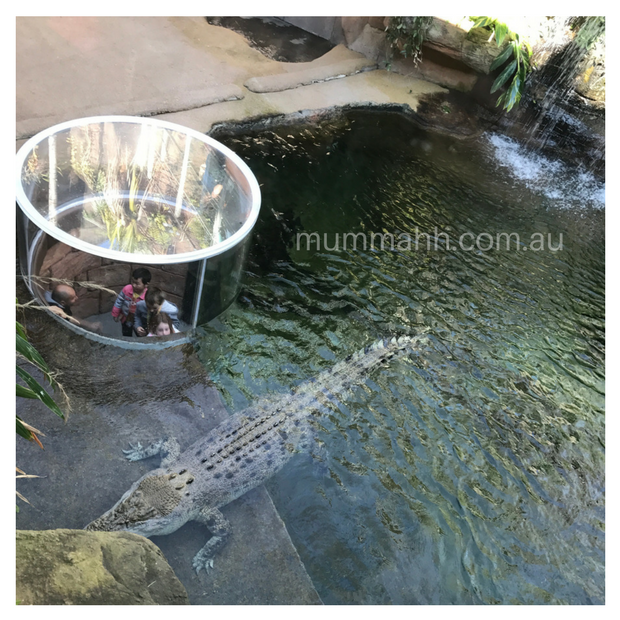 Last weekend my daughter celebrated her birthday with a day out at WildLife Sydney Zoo located at Darling Harbour. Yes, that’s right a zoo right in the middle of the city! If you haven’t been to WildLife I highly recommend it. There are a few attractions located at the same location including SeaLife and Madame Tussauds but I would have to say WildLife is probably my favourite attraction among this fantastic group. 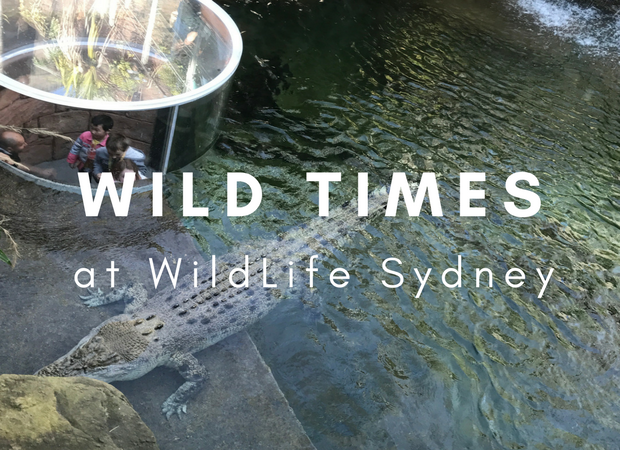 There is quite a bit to see and do, so I would recommend to plan at least 2-3 hours for your visit to WildLife Sydney. Once you enter, the first attraction is the Butterfly Tropics where it is really humid (just like the tropics) and we all had to take off our jackets and jumpers. There’s butterflies flying around and lots of tropical plants in here, which really makes you feel you have left the city and entered a lush tropical rainforest. Next up is Wallaby Cliffs and the Devils Den where you can see the Tasmanian Devils and a range of native wildlife like wombats and wallabies. We were shocked at how big the wombats were! Each display has heaps of information about the animals and their habitats. If we couldn’t see the animals straight away (especially the ones that like to hide or are camouflaged) we had fun searching for them. We continued on through Gumtree Valley and Daintree Rainforest through to the Kangaroo Walk-About. Here you can walk amongst the Kangaroos and other animals – it’s quite amazing to be up so close. We then headed up to the Koala Rooftop where the cute Koalas hang out. Koala encounters happen between 11am – 5pm and you can get a photo with a Koala! We were there for the 12.30 Koala Talk which was really interesting. In most areas you will find talks and animal encounters throughout the day, you can find all the times for these on the Visitors Guide you get when you purchase your tickets. Up with the Koalas you will find WildFlight. WildFlight will cost you $10 per person and is not included in your ticket. If you like adventure and aren’t afraid of heights then this is your thing. 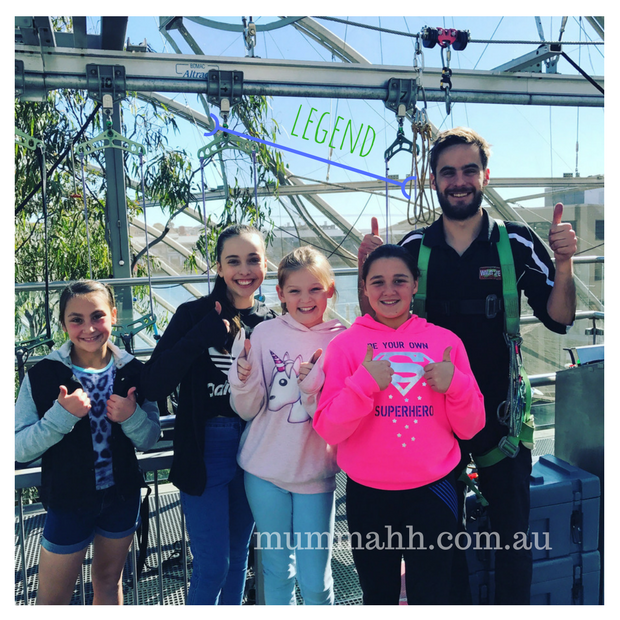 Me – I’m terrified of heights, but the kids needed to be accompanied by an adult so I had to go (eeek). I was comforted by the guy who was strapping me in, who assured me that the very thin looking ropes could hold the weight of four elephants. The kids had no fear they were loving every minute. Once you are strapped in safely you pull yourself around the rooftop pulley system with ropes. It is all very safe and a great view, but just as I was nearing the end of the ride we couldn’t seem to pull – we were stuck. I’m just glad we weren’t dangling over the crocodile enclosure. We had somehow managed to get the ropes tangled. The wonderful guy who prepared us for the ride came out to untangle us. I was happy to be on solid ground but the kids wanted to go again! I want to make a special mention of the bloke in the picture below. He came out to untangle us and was super professional – an absolute legend! He was calm, confident and quickly came out to untangle us. Now, apparently this has never happened before and I want to make note we were never in any danger – as I said the kids thought this was an awesome adventure. Even though I am scared of heights I would recommend the WildFlight ride for those who like added excitement, and it was really a fantastic view from up there. After the WildFlight ride I felt I could take on anything so a massive crocodile was nothing. Well actually it was pretty scary and huge! There is a great little viewing cave – the Croc Cave – which you can see the croc eye-to-eye. After the croc you head into Night Fall where all the nocturnal animals are on display. It really is a fun and educational day out. 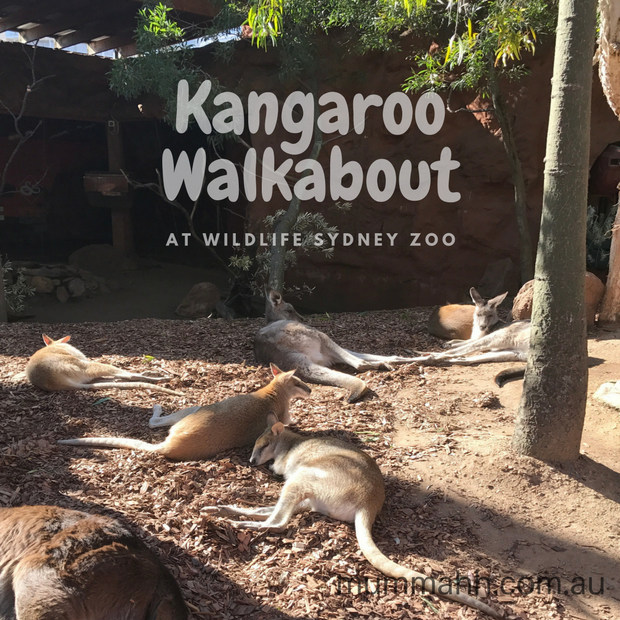 You can make a real day out of your visit to WildLife Sydney Zoo. 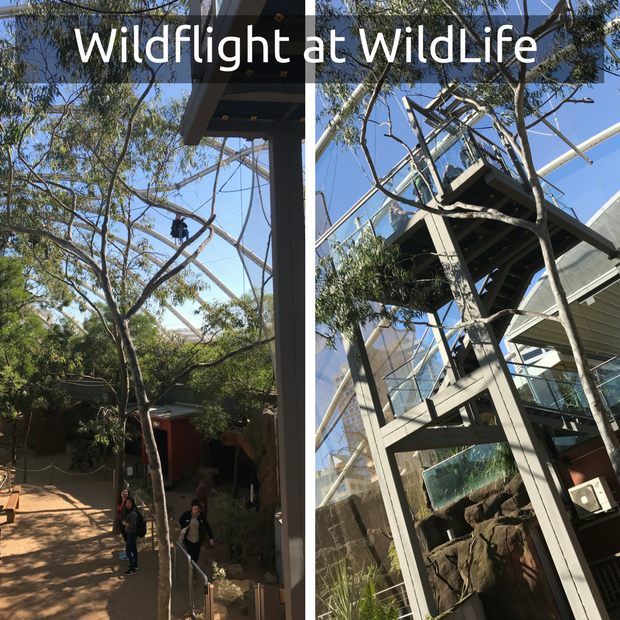 There is a little cafe up on the Koala Roof Top and there are heaps of talks and animal encounters to see at different times throughout the day.